Not much is worse than running into a spider web at night; those sticky little web fingers cling to your face and hands, and you never know if that spider found a new home on your sweatshirt sleeve or hood. There’s a great solution to this conundrum: find a light. With a flashlight, you can see every web and avoid it or poke it with a stick. Curtis uses this analogy to open up a conversation about evil spirits—people are always bumping into them on the spiritual path of life. 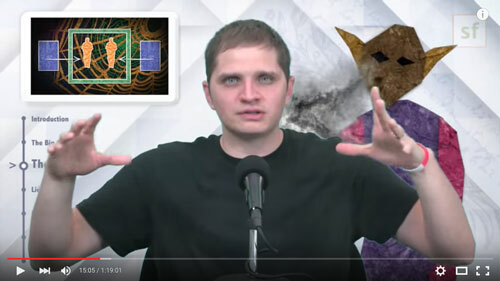 In this episode of Swedenborg and Life, host Curtis Childs talks about the lies that evil spirits feed us, examining ideas like the way hellish spirits cover up their lies, the intent behind the lies, and the way evil spirits use negative energy. Curtis ends up showing us ways to defeat and use this knowledge to improve our lives. 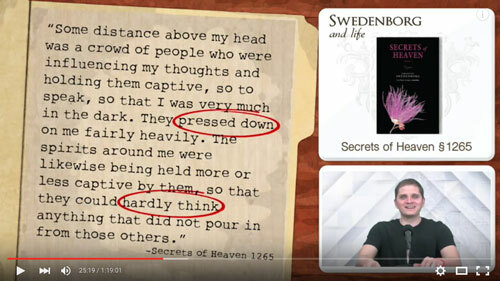 While Swedenborg was working on his theology, he discovered that evil spirits try to make people think that every evil thought came from their own mind. This means that evil spirits could put nasty thoughts into our heads and try to make us believe that those thoughts belong to the human being. In this quote, Swedenborg says that evil spirits sometimes give us bad ideas; the negative intention from evil spirits drags us down into evil thoughts. These bad thoughts don’t come with “evil spirit disclaimers.” They wander into our minds just like all the other thoughts do. However, these thoughts don’t come from something we love—usually, they stem from the evil spirits’ desire to bring us down. Curtis brings on a few specialists to give more human examples of these negative experiences, including Jerry, a therapist who has worked with schizophrenic patients for years. Jerry told stories of people who had horrible, disconnected thoughts wander through their heads. Swedenborg agrees with this conclusion, saying that evil spirits stir up our “rationalizations” and want us to work toward doing evil things and finding ideas that connect with the bad ones (Secrets of Heaven #653). Swedenborg says that no one is able to fight evil until they know how to see and recognize evil and false ideas (Secrets of Heaven #1661). This means that we need to be educated in good and true ideas to fight evil ones. When these evil spirits come to feed lies to us, Curtis advises watchers to treat bad thoughts like telemarketers—and the first thing one must do with a telemarketer is find out what they’re selling. We have to have enough information about the negative thoughts or emotions before we believe them, just like we have to know what a telemarketer is selling before we sign on the dotted line. Guest psychologist Jerry says that the intent of these evil spirits is to create negative emotional energy toward the individual and the people around them. Swedenborg says that evil spirits “want nothing less than to destroy everyone. Nothing thrills them more than causing pain” (Secrets of Heaven #1680). Curtis introduces the concept of the spiritual food chain to take a deeper look at the way these evil spirits use our negative emotional energy. Jerry says he believes that evil spirits feast on these negative emotions, using them as food to fuel themselves and give them power, just as human beings use food as fuel. Jerry noted that schizophrenics dealing with angry, screaming voices would look as though it took all their energy just to listen to the voices in their heads, leading to the phenomenon called energy drain, in which evil voices drain the energy from people. Listen to Jerry tell a particularly heart-wrenching story about the toll that listening to voices takes on human beings at 17:32. Throughout Swedenborg’s work, he notes that evil spirits pervert everything good—they twist all good and true things to make them evil and false, and then introduce the twisted ideas into people’s brains. Evil attaches to everything loving and tries to tear it apart. Evil spirits love to see us tear ourselves apart with negative ideas and feelings that constantly bring us down. Curtis reminds watchers that these evil spirits aren’t very straightforward in their manipulation—they slowly bring in more and more negative ideas and feelings until they can overwhelm any good feelings or thoughts of love. At 24:55, Curtis stumbles on the top-secret directions for spinning webs of lies. 1. Keep People in the Dark. We can get weighed down by evil spirits and their influence, fueled by mental exhaustion and a lack of positive ideas. Evil spirits want us to stay in the dark, without anything to lean on. An endless pit of darkness and heavy weights sounds pretty hellish . . .
2. Create a Fog of Emotional Confusion. Evil spirits have horrible methods to create confusion and indecision in us. They want us to struggle and get confused about what is good and what is evil, what is true and what is false. If they can get us thinking backwards and doing evil things, they will add bad things on top of bad thing. Evil spirits desperately want to destroy the truth and confuse us into thinking that falsity is truth. They try to get humans to focus on one negative idea and let that take over. 3. Isolate and Divide People. Evil spirits want to be the only ones in control. They want to get us alone and isolate us from others, leading to a flow of thoughts like: “No one likes me.” “I add nothing to the world.” “I’m worthless.” “No one wants me here.” “It’s all my fault.” They focus on creating feelings of guilt and loneliness, isolating the individual they’re focusing on. 4. Create Depression and Anxiety. Evil spirits love depression and anxiety because it leads to isolation and unhappiness, without the ability to see truth or love anything. Depression and anxiety are a horrible struggle, and evil spirits want to keep us down. Forever. 5. Drown People with Lies. Evil spirits want to persuade us, convince us, and flood us with everything evil, to the point where we can experience nothing but sadness, depression, guilt, fear, etc. 6. Destroy perspective. When evil spirits destroy our ability to gain perspective, they also take away most of our ability to get out of any pattern of negative thoughts. Without perspective, it’s hard to climb out of a pit of depression or isolation. It becomes a never-ending cycle of horribleness, which is exactly what evil spirits want. In that pit, they can trap us into thinking that there’s no way out. Evil spirits access people because humans are kept in a spiritual equilibrium, where they can be affected by evil things and good things. This balance allows freedom and consciousness, but it also means that we’re free to dwell on negative (or positive) ideas or influences. It’s important to remember that we’re always free to choose our path, even through desperate struggles. No one will ever love you because you’re a piece of garbage. You’re worthless, a burden to everyone around you. Everyone else is better than you. You don’t deserve to be treated well. People don’t care about you. There’s nothing you can do to make this better. Evil spirits are desperate to produce guilt and fear to create that negative energy. Thankfully, Sherry discovered that she could reprogram her brain and discourage all the negative pathways, which leads to the next stage . . .
Sherry talks about reprogramming her brain to correct the negative cycles her brain would go down whenever something went wrong at 40:10. She knew that the brain contains many electrical signals and pulses, and as human beings create patterns of thoughts, they create grooves in the pathways of the brain. She decided to recode her pathways, creating a mental “program” called, “That’s a Lie” —every time a negative thought came to her, she would think, “that’s a lie.” This program tells the evil spirits in the mind that people are closed for business. If evil spirits are unable to succeed and create negative feelings or thoughts, they will eventually go away, just as a brain pathway gets reworked when we’re changing behaviors. This is a slow, gradual process. Eventually, this process takes the power away from the evil spirits and puts it back in the hands of the individual. In the end, we should have the power, and by creating more positive pathways and attitudes, we can change the way we interact with evil spirits. Sherry talks more about her interactions with the evil influences in her mind at 45:25. In the end, Curtis reminds viewers that God uses the negativity of evil spirits to bring about positive things, which brings a discussion about ways to deal with evil spirits—even going as far as talking about laughing at the absurd ways that evil infiltrates the mind. We need good things from God inside us to fight against evil, using the good ideas to fight against the bad ones. Eventually, this leads to a near immunity from evil influences, because evil spirits need to succeed and bring about evil. Without success, they have no power. Evil spirits only attack us when they think they can win. They can sense when people have strength against evil, and that strength encourages evil spirits to run away. Sending love toward evil spirits makes them flee, because they are so scared and repulsed by love. Sherry describes this process and discovery at 58:46. This process describes a way that wounds can be opened up and healed, so that we can move on and continue to find good and truth in life. Swedenborg talks about a better life for everyone, even evil spirits, in that they can be less evil and experience more happiness. This means that evil spirits are not always an attacking force—they can also be just a presence, harmlessly nasty. In the end, the truth helps us determine what is good and evil. The truth will set us free. 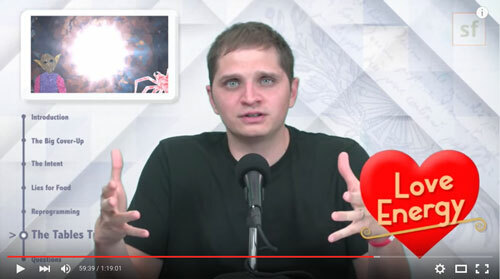 Did Swedenborg see Earth from Heaven? And did it look like an enclosed dome? Do the influences of evil spirits also come in the form of desires? Or just thoughts? Are evil spirits sent from somewhere to test people? How do you get rid of addiction to the dark high one gets from the spiritual pain evil spirits cause? 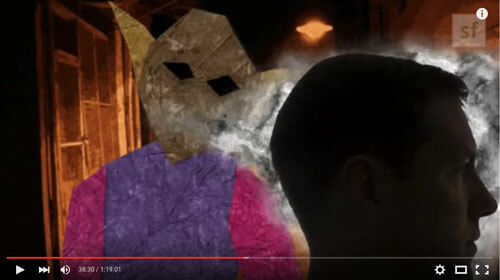 How might this tie in to the entities experience in sleep paralysis? What about memories (which are used in survival) that haunt you at times? Is that pushing you to be good, is that evil, or is that both? Do evil spirits get more subtle (more devious) as you gain wisdom? In Swedenborg’s books, does he define what spirit is? Is it separate from the soul? Or one in the same? What does Swedenborg have to say about Sages? Are these embodied spirits, or departed spirits? The evil I experience are the people I’m around. Depression wiped out all of my joy and pleasures of my life. I feel so broken and lifeless. I feel like a walking corpse, I come home only to bed. What can I do?